Awesome view for the meteors showers last night! 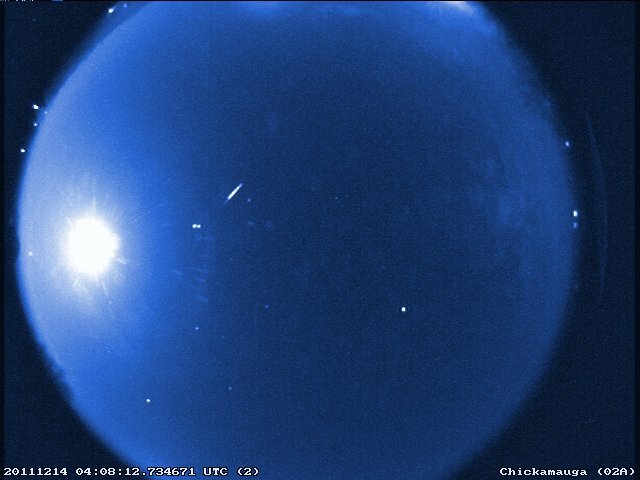 A better weather next meteor shower! Hello NASA Here in the South of england (UK) we keep getting big/huge bursts of lights in the sky second night now since its been happening, Was wondering if this could be the cause? As there was no thunder or lightning bolts just the whole sky brightening up. Last night was some Wired distant thunder quite high up followed by hail so thought it was just a storm. Until today when we saw a massive bust of light which has our local media asking questions. So just wondering if this is still happening or is something else is happening in space? I am working all night tonight Wed 14/12/11 and im hoping to see something around midnight or so my local radio station tells me fingers crossed . carl0151 liverpool. just been looking out my window and saw 5 meteors within the space of 10 mins between 11:30-11:40. Stunning Experience. Amazing job you have done here!